Back in August of 2011 the area was hit by Hurricane Irene. The area received extensive damage from the storm but luckily our station only received some minor damage. However one week later we were then hit by a F1 tornado which clipped the corner of our building causing some more significant damage. After tons of paperwork, studies, applications, and bids we are finally able to make repairs to our station. Over the next few weeks the building will be completed and the work on the drainage will start. Thanks for everyone's support during the past year and a half. The Cranesville Fire Department along with the Ladies Auxiliary would like to wish safe and happy holidays to everyone. It is also the season for holiday parties and bad weather. Please have a designated driver or call a cab if you have been drinking. Yellow Cab 842-3000 and Community Cab 842-4788 both service the Amsterdam area. If the weather starts to turn bad take it slow to your destination. Ever wonder how we train? Click on the picture to check out our last drill. 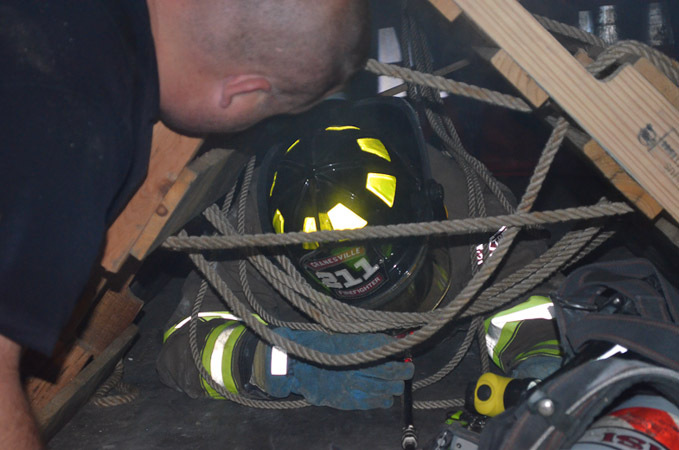 Training helps keep us safe and also keeps us in practice for when the need arises to possibly help a resident that may be trapped during a fire. When you need help fast you call us but will we be able to find your house quickly? Please make sure we can clearly see your house number. House numbers should be at least two inches tall and reflective. Help us help you. Reminder that the NYS burn ban is now in effect until May 16th 2012. All outdoor burning of any kind is banned. Violators are subject to both criminal and civil enforcement actions, with penalties ranging from $375 to $15,000 for a first offense. To report environmental law violations, call 1-800-TIPP DEC (1-800-847-7332). From all the members at the Cranesville Fire Department our hearts go out to everyone affected by Irene's fury. We will continue to offer our support to the community we protect as well as our neighbors who took a much harder more devastating hit from Irene. Cranesville Volunteer Fire DepartmentCopyright @2015 All rights reserved.